Below are the results of 27th Annual Daffodil Show hosted by the Fortuna Garden Club on March 23th & 24th. and the name of the exhibitor. Below are the results of 7th Annual Mother Lode Show held March 16th & 17th and hosted by Kautz Ironstone Vineyard. Horticulture Show Statistics: 706 exhibits, 403 blooms, 18 exhibitors. Artistic Arrangements: 37 arrangements and 16 exhibitors. An exhibitor always wishes for (1) good growing weather during the Spring, (2) good picking weather for the days before the show, (3) peak bloom just before show time, and (4) quality blooms. Damned if all these wishes weren’t granted this year for me! The result was a carload of good flowers taken to the show at Kautz Ironstone Vineyards in Murphys. I can remember such fortuitous circumstances all happening only once before: in 1989 for the ADS National Convention in San Francisco. 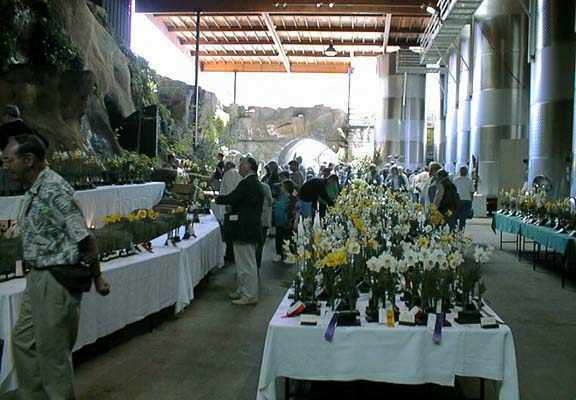 Our Northern California Daffodil Show is part of the “Spring Symphony of Daffodils” festival at KIV. As such, we benefit from their publicity and the resultant flood of visitors coming for the festival. The town of Murphys nearby also has a major St Patrick’s Day “Irish Days” celebration on Saturday and shuttle buses run all day between downtown and the winery. This obviously provides many more visitors. The show area was packed from opening on Saturday morning to its close on Sunday afternoon. I would guess that we get as large a walk-through crowd as any daffodil show in the US. Now established, it behooves us to do effective planning to get more ADS and NCDS members from show visitors. This year, members of the local Calaveras County Garden Club provided an Artistic Arrangements section. The exhibits were stunning! Judging was done by Dian Keesee, currently an ADS Pacific Region Director. This coming weekend Dian dons yet another hat as Show Chairman for the Fortuna Daffodil Show. We anticipate being a Garden Clubs “Standard Flower Show” next year. This year, a hot show item was the Grant Mitsch catalog. As an experiment, Elise Havens sent us a bunch of catalogs which we sold out within a couple of hours. Next year, we must at least triple that order. Let’s hope that many of the folks who bought the catalogs follow-through with their enthusiasm and buy bulbs. That will help us get local folks growing modern daffodils! Next year, we’ll solicit catalogs from the other growers too. This year, we directed many people to the Internet Home Pages of ADS and NCDS. If you didn’t comprehend the wisdom and importance of changing the ADS Home Page “URL” to “daffodilusa.org”, it will become obvious when you are telling people where to find us on the ‘Net. The NCDS address is “daffodil.org”. Credit for reserving and implementing the Internet addresses goes to Ben Blake and Nancy Tackett. Amazingly, I found that a majority of the visitors had access to Internet. A silly oversight: we didn’t print the Home Page URLs on the schedule! We experienced practical benefits from the ADS and NCDS Home Pages. One plant-interested couple from several hundred miles away e-mailed me a couple of days before the show. They were starting a two-week junket around California and asked if they could HELP OUT at our show! They arrived Friday at 2pm before I did, bustled into setting up the show, and stayed until 10:30pm that evening! They filled test tubes from 4pm til 10pm! They then returned on Saturday morning and CLERKED during the judging. All they got for their efforts were lunch and a complimentary bottle of wine. They said they had a great time; and were then off 300 miles south to see the wildflower preserve in Antelope Valley. Daffodils followed by California poppies! facilities for meristeming which might be usable to cleanup some important cultivars (eg, ‘Eileen Squires’ comes to mind). He came to the show on Saturday and spent lunch and the afternoon with us. Bob Darling did a exemplary job explaining the the basic time process involved in hybridizing, the ADS relationship with hybridizers, and exploring useful options. Yes, Bob Darling of Washington DC exhibited and judged at the show. He brought a group of his miniature seedlings, which won its five-stem miniature class. They were excellent. This is a side of Bob we we not aware of on the West Coast. He also spent Saturday using his digital camera. We were privileged to see the pictures on his laptop that evening after dinner. Kudos Bob! Gene and Nancy Cameron came for the third year! Portland to Murphys is a 700 mile drive! Gene and Nancy staged Sid DuBose’s blooms. They also helped set up the show – and were judges. Help we could hardly do without. Thanx Gene and Nancy! KIV is a near-perfect setting for a daffodil show. The surrounding area is in bloom with naturalized daffodils. Contrasted by the pruned but dormant vines, it is a remarkable landscape. We had 21 exhibitors this year. That is a large number for an NCDS Show, especially when you consider that most exhibitors had a several-hours drive to get there and stayed overnight at local motels (which had to be reserved ahead several months). Of these, 18 exhibitors won a Blue Ribbon. I won the Pig Prize for the most Blues (36) but Kirby Fong (28) and Wayne Steele (20) were piggish as well. First-year exhibitor Bill Scholz did pretty well – eleven Blues! (Bill and Wayne are our octogenarian pair. What a fearsome foursome it will be when Sid DuBose and Stan Baird join them.) Bob Darling got four Blues as a reward for his journey. The Camerons groomed Sid DuBose’s modest quantity but high-quality blooms into ten Blues. KIV grows many show cultivars, waiting to establish them in the quarter-acre hillside daffodil garden site under preparation. From these came six Blue Ribbon winners (most were Barwick or Ramsay cultivars). Local citizens Tracey Ellifritz, Chris Gomez, and Lore Gates won Blues. The Calaveras County Garden Club also submitted several horticultural entries. The show contained 528 exhibits totaling 870 stems. Of these, 762 blooms were Standards; 108 were Miniatures. 497 blooms were exhibited as single- or three-stem entries. There were 33 blooms in the special classes for local residents only. There were 25 entries in the classes for exhibitors growing 100 or fewer cultivars. There were ten excellent container entries. Kirby has listed the winners of the ADS awards in another e-mail. 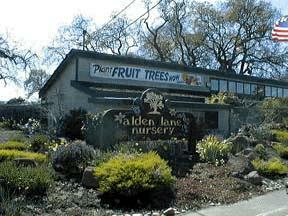 As with last week’s Livermore Show at the Alden Lane Nursery, the Murphys Show has the perfect host. Each of these two facilities provides us with exemplary space for a show. We have a synergistic relationship with our hosts. We add a facet of interest to draw the public, and we greatly benefit from visitors/customers at their facility. As show organizers, could it be better to arrive at the show site and see the tables already in place and covered with tablecloths? And to see the boxes of our equipment already moved into the show area? At show end, could it be better than just to repack the equipment and leave the boxes on the floor? 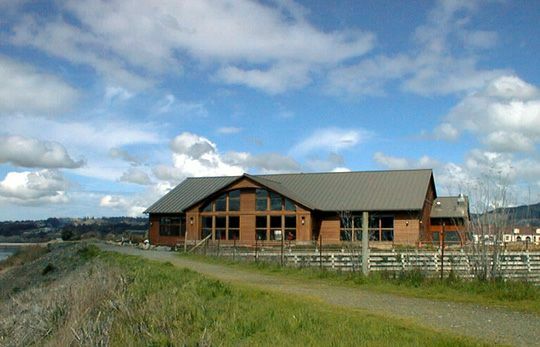 We give a hearty round of appreciation for the support given us by Kautz Ironstone Vineyards. On to 2002! he was a permanent part of the weekend! I just got home from the Murphys daffodil show held at the Kautz Ironstone Vineyards in the Sierra foothills of California. The show coincides with the Murphys Irish Days, so there are a lot of people in town. The vineyard has tons of daffodils planted around the countryside and many half wine barrels planted with daffodils at the winery. Because the winery lets people park for free to take the free shuttle into town, there are a lot of people wandering around the winery and into the daffodil show. Several of the daffodil judges in California were unable to attend this show, and we are grateful for Gene and Nancy Cameron of Oregon and Robert Darling of Washington, D.C. coming to judge. Robert even brought flowers! The best in show was a triandrus seedling bred by Bob Spotts. Though described as 5Y-Y, the cup was a deeper yellow than the perianth. The two florets had very smooth, symmetrical perianths. Runner up in the voting for best in show was my stem of Cameo Rebel. Below are the results of 2002 Livermore Show held on March 9th & 10th hosted by Alden Lane Nursery. The beautiful banner at Alden Lane announcing our show!